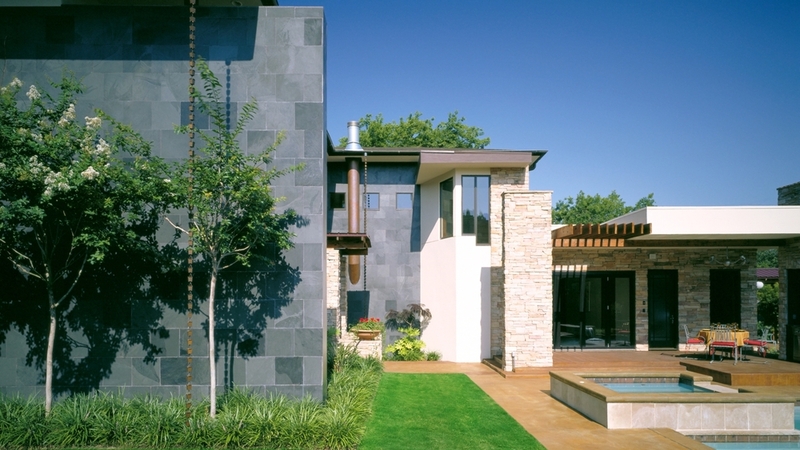 The design of this home that is based upon a desire to create a “green” home that represented an appreciation for modern Texas style. The result was a house that represents both of those objectives, and emphasizes their enjoyment of entertaining. 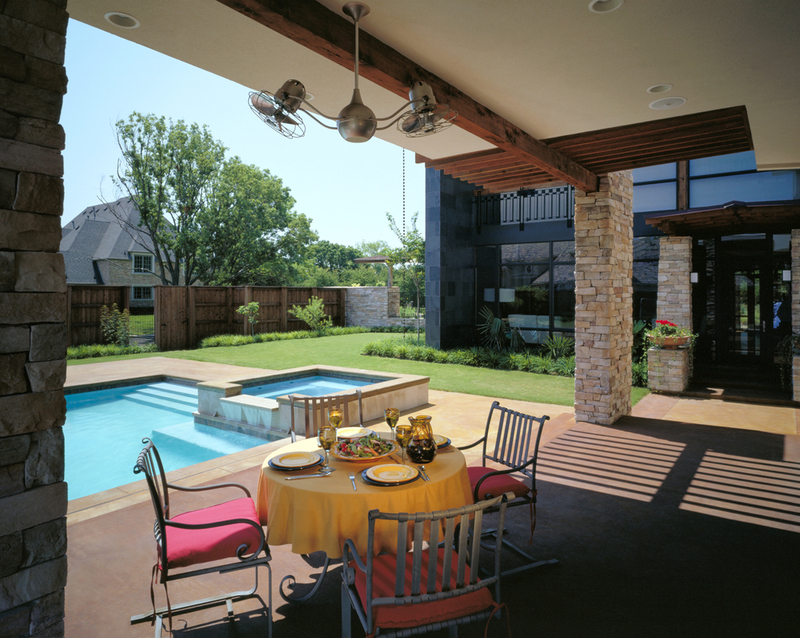 This home was selected and published by D Magazine as one of Dallas’ Most Beautiful Homes. The house is a western contemporary style representative of architecture heavily influenced by the Texas climate. In common with the Mission/Prairie Style homes of the mid-century, this house uses strong environmental influences to create shade while inviting natural light to flood the house. A three story stone wall penetrates the house as a primary organizing element and breaks the open floor plan to create intimate living areas. Building materials are used in methods indigenous to the Texas area and create dramatic spaces that flow from inside to out. Focusing on environmentally sensitive design, the house takes a green approach to constructability. The house uses simple design features to reduce the environmental impact of the house and reduce energy consumption. The design of extended roof lines for solar shading on the southern exposure reduces the heat gain in summer, and allows heat gain in the winter. The large amount of glass on exterior walls requires that very little supplemental lighting is needed most days reducing energy consumption. The five-car garage, with a 1,350 SF loft above, is located on the north end of the property. The garage is detached from the house, improving air quality inside the house and creating a courtyard between the house and garage. The courtyard is an exterior dining room surrounded by gardens and shaded by a trellis. Interior spaces of the house feature warm materials with a variety of textures. Bamboo flooring in the formal entertaining areas and limestone flooring in the casual entertaining areas offer natural materials with a contemporary flair. Accents in the dining and kitchen area feature panelized wood drop ceilings with task lighting.